You can’t beat an outdoor wedding for enchantment. Nature’s natural beauty is unsurpassed in its magic and perfection. Plus, you save a bundle on the decorations. Nature itself will serve as your wedding designer. 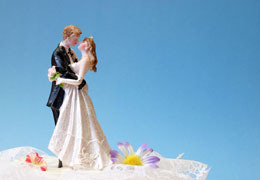 In addition, a scenic outdoor wedding makes an incredible backdrop for your wedding pictures. Flattering natural light and the beautiful outdoors add up to amazing pictorial memories. Be sure to hire a photographer with experience in capturing the charm of outdoor weddings. Whether you chose a sun-drenched beach or a star-lit lake and mountain venue, you will nature’s own palette to highlight your dream wedding. Of course, the setting and landscape will be an inspiration for your entire wedding theme, tone, and mood. The great outdoors is vast, giving your guests abundant room for dancing, socializing, and simply having fun. The best times for an outdoor wedding are spring and autumn, when the weather is at its best, and nature is at its most colorful and sublime. Depending on where you live, temperatures during summer and winter months can become extreme. Don’t let rain intimate you into canceling your plans. While you may want to arrange for tents for the wedding reception, a rainy day can be incredibly romantic. Provide your guests with umbrellas for the ceremony. Channel your inner Gene Kelly and just dance in the rain. 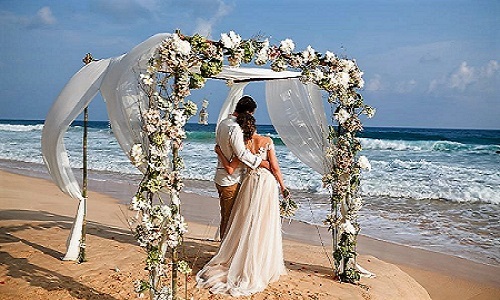 A beach wedding, with the ocean in the background, tends to be more casual than some other types of outdoor venues. Keep the décor at a minimum to emphasize the beauty of the location, and use the items from the setting to showcase your theme. Use shells or driftwood as name plates and signs. Shells and anchors can be used as overall decorations. You can have your reception right by the water or on the water by hiring a yacht for your reception. The menu will be from the sea. Fish or other seafood in any form should be enjoyed by all. From caviar and lobster to fish tacos, you can make it as casual or elegant as you wish. Serve drinks from a colorful tiki bar. Small, planted pots of seagrass can substitute for the standard ribbons for that walk down the aisle. Since beach colors are gentle and subdued, you can create a fabulous spectacle in contrast with the bridal party’s dresses and bouquets in bold hues of red, purple, and orange, accented with some lush green. This country has a vast selection of vast mountain scenery. Some couples use the mountains for both the wedding and reception venue, while others bask in the glorious vistas only during the ceremony. Either way, it’s a guaranteed magnificent occasion. Being in the mountains invariably involves some walking, not to say hiking. Perhaps heels are best traded for chic boots. Dancing on a rugged surface may be difficult for the ladies, so a box of flats will be appreciated. 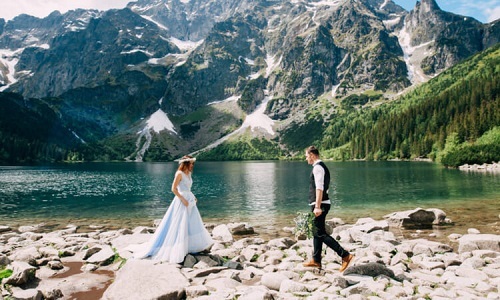 Like beach weddings, mountain weddings tend to be more casual when it comes to clothes. A black suit for the men. A simple gown or dress for the ladies. Enhance the setting with your decorations. Centerpieces of local wildlife, such as elk, make adorable decorations, as do pine cones and garlands of pine. Once again, nature provides its very own decorator. Since the mountains have such variant deep tones, use delicate hues, such as pink or lilac, for your bridal party as a contrast. Keep your guests’ comfort in mind when inviting them to a high altitude. If a ski lift is available, guests are likely to enjoy this mode of transportation to reach greater heights. It’s easy to become dehydrated up there, so please provide water bottles for everyone before popping the champagne. Also, climbing the terrain may be difficult for some of your older guests. They will appreciate a few comfortable seating arrangements to catch their breath. It can get chilly fast in those mountains, so a few blankets may come in handy. Your guests will appreciate the thoughtful touches. When you’re out in nature, bugs and tiny critters can be a factor. Don’t leave food unattended. Instead, cover your food with a glass dome or cloche. No need for you to feed any wedding crashers. The very essence of a backyard wedding is casual, comfortable and family, so think low-key when it comes to food and activities. Photos of family can be placed in designated areas. If you have wedding pictures of grandparents and parents, they add a wonderful touch and will evoke many memories and discussions. 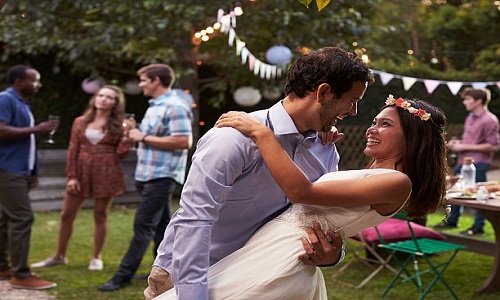 A backyard wedding lets you opt for a variety of dress styles. From a simple white gown to a flowing floral creation, keep it as relaxed as the venue itself. 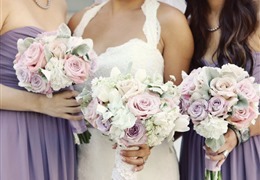 With all the different colors in your backyard, your best choice for your bridal party and bouquets is to go neutral. 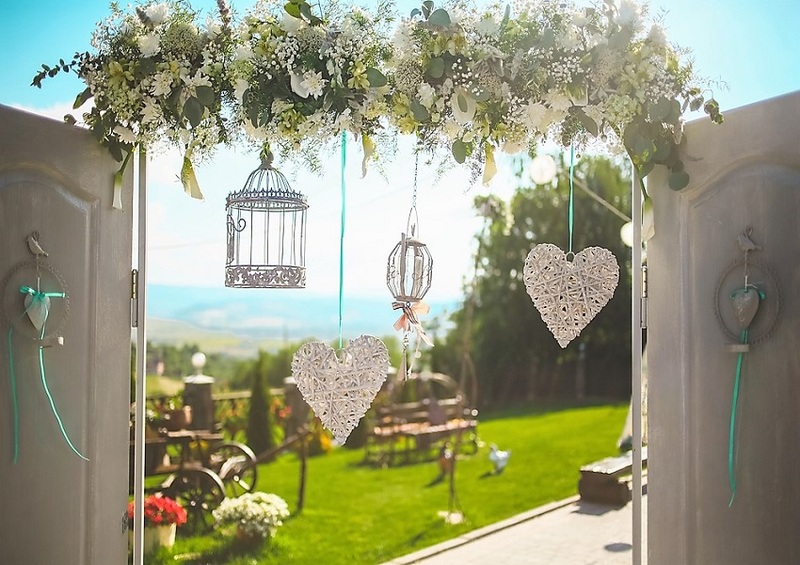 If you are unsure how many guests your backyard can accommodate, a wedding planner can analyze the area and may be able to find space in some unlikely corners. Whether you opt for home cooking or catered, an experienced wedding planner will make maximum use of the space available when arranging your seating plan. Long picnic tables work great for a backyard wedding. Unless you want to ruin your backyard for the season, setting up a dance floor is highly recommended. Have a DJ rock the party, and your guests will dance all night long. The menu at a backyard wedding can range from elegant to casual, but it’s the perfect venue for some home-style cooking, even if it is provided by a caterer. Think BBQ and beer. A standard wedding cake might be de rigueur, but your guests will love a homey dessert such as apple pie. Cookies are the perfect treat for them to enjoy on the way back home. Botanical gardens, with their magnificent array of colorful blooms, are a very popular wedding venue. They make the ideal backdrop for any wedding. 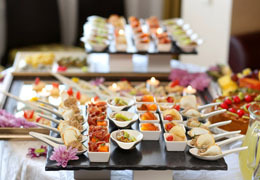 Most botanical gardens offer their own catering service, but many allow outside caters for a wedding. When planning your wedding at a botanical garden, you have a combined venue for the rehearsal dinner, ceremony, and reception. Flowers are all around you, free of charge. Your guests will enjoy wandering around the formal gardens, which provide the perfect entertainment. Since the gardens are their own decorations, not much else is needed. Because of the lushness of the surroundings, a botanical garden wedding can be the most formal type of outdoor wedding. Tuxes and elegant gowns are perfectly appropriate amid the formal flora and fauna. Coordinating your gown and bridal dresses with the color of the blooms will create a lovely picture. There is magic in having an outdoor wedding. The possibilities for different types of scenic wonders are endless. You can create your entire wedding theme around the venue with minimal effort since nature will be doing most of the work. You and your guests merely have to show up and enjoy the abundance.